The bowling alley is great for kids and adults! 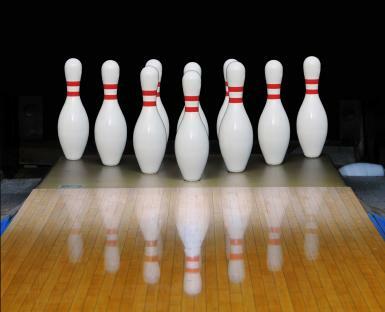 Bowling is a great way for people of all ages to have fun, no matter what occasion is being celebrated. 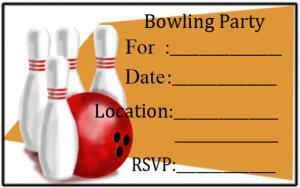 Prepare and print free invitations to a bowling party to get all your friends and family to the lanes! 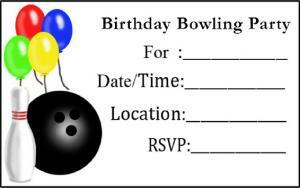 Bowling is a cheap and fun activity, and when you download and print free invitations, you continue keeping the party low-budget. 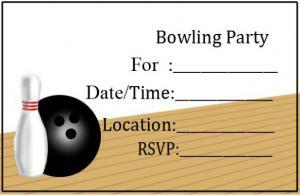 The invitations below will print two on a standard size piece of cardstock. Simply click on the invitation description or image to open it using a PDF reader. Fill out the information in the new browser that opens and click to print. You can also save your document, should you want to print the invitations later. The invitation featuring balloons is especially suitable for a festive occasion like a birthday or surprise party. When filling out these invitations, you may want to specify what time guests should arrive to choose their shoes and balls, and what time the games will begin. The hosts should also include a notation that guests who wish to bring their own balls, shoes and other gear to the party are free to do so. 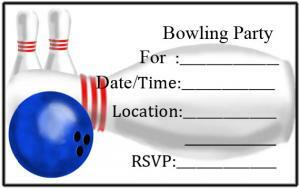 Start your party off on the right foot by picking out a bowling invitation that gets guests excited about the upcoming festivities. Free invitations make party planning not only cheap, but easy, for any harried host.